We're part of the geek elite and are Star Wars fans. We are such big fans that my husband and I actually met online playing Star Wars. We don't go to the conventions and we don't have costumes so we are not part of the geekest of geeks! 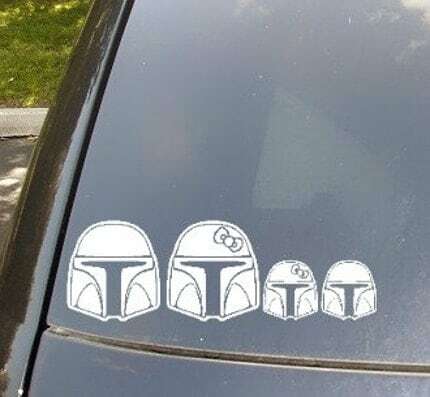 I fell in love with these car stickers. You usually see the ones with stick figures but these are of Star Wars! She does carry other characters like Star Trek, Mario Brothers, Autobots and much more. Interested? Check out her Etsy shop here. Customer service is exceptional! I need these. DH and I are huge star wars fans. We don't do the conventions either but that doesn't mean we don't geek out over stuff like this. I already ordered a set for myself and one for my adult daughter! Two sets were only $15 which for us was one set = 7 stickers and the other was two. Great deal!